Undo close tab—It’s amazing how often this comes in handy. Duplicate tabs—This creates a duplicate of the current tab, complete with back-button history. Very useful. Open selected links in tabs—Select a block of text containing links, right-click, and instantly open every link in a tab. I use this every day with some of my site maintenance tasks. Drag and drop reordering of tabs—I don’t need this often, but it’s a cool feature. Display unread tabs in red—I tend to open tabs in the background for later reading. This feature highlights the ones I haven’t read yet. It also changes a tab’s title text to red when the page has updated, great for web applications. Along with all of those features, it solves my original problem: you can set whether the hotkey closes the window when there is only one tab open. This is an essential plug-in that completely replaces Tab Browser Preferences. It works well on both my PC and MacOSX laptop, and I have yet to experience any kind of crash. I know some of these features are going to be included in Firefox 1.5 without an extension, but until then Tab Mix Plus is very handy. The new MSN search that uses Microsoft’s new search engine rather than Yahoo’s results has been in beta testing for a while, but as of today it’s open for business. Microsoft is launching an advertising campaign for the new search engine that will include ads during the Super Bowl, the Oscars, and the Grammy awards. Obviously Microsoft is willing to spend some of their billions to get this search engine noticed. I’m not sure how many people will use it over Google, but I’ll be keeping an eye on it. Currently my sites get most of their traffic from Google, about 1/4 of that amount from Yahoo, and MSN runs a distant third. The results at MSN are wildly different, though, so some sites will benefit more than others. Also, Douglas at Stopdesign is impressed that MSN is using reasonably standard XML and CSS for the new site. I previously mentioned Google’s announcement about the rel=nofollow attribute. There has been much enthusiasm about this, and much backlash against it, since then. It’s certainly not a miracle cure for anything, but I don’t see how it could hurt. Yes, spammers will keep spamming. Eventually, three or four years from now, they’ll notice that their spam links are having less effect, but they’ll still do it—the fact remains that it’s little to no work for the spammer, so if even one person clicks on a link it’s still worthwhile. Just like email spam. Many people have complained that this is only a good thing for Google—it just helps them sort out different types of links. Of course that’s true, but an advantage for Google is an advantage for all of us. If Google has more information about links, they can improve their search and ranking algorithms. We’ll see less spam in search results, even if we see just as much on our weblogs. I’m not going to support the attribute on any of my sites. I monitor them daily and quickly remove any spam that gets through, so spammers already get no benefit here, and I want legitimate comments to get the benefit of their links. The biggest benefit for the web at large will be that there will no longer be thousands of abandoned weblogs out there that can be freely spammed with links that won’t be removed for years. One more thing: as Scoble said, it’s amazing that Google was able to get their biggest competitors, and several other companies, to agree on this and implement it within a few days. Why can’t we see this kind of cooperation in the world of Instant Messaging? I’m sure Bloglines will fix the problem soon, but in the meantime I just want the feature to work, so I tried to fix it myself. I noticed that the problem appears first in the “Clip/Blog This” pop-up form. You can edit it there manually, but I want clipping to be a quick two-click process. I love the idea of being able to fix broken web sites without waiting for their developers to do so. Greasemonkey was inspired by this extension that Adrian Holovaty made to solve problems he was having with a specific site, AllMusic. Now anyone can do it with a simple script rather than writing a whole browser extension. Excellent! Update 1/17/2005: This is no longer necessary, as Bloglines has fixed the clippings bug. Yesterday my wife and I dealt with a major trackback spam attack, and apparently we weren’t the only ones. Judging by the forum posts, this was a massive attack across at least hundreds of weblogs. If you have a WordPress weblog, there’s a new plug-in that puts trackback pings into the moderation queue. Since trackbacks aren’t scanned by the built-in filtering system like comments, this is definitely needed. Most of us don’t get enough trackbacks to mind manually approving them. Another possible solution is verifying the IP addresses of sites that send pings. This raises a couple of issues (such as sites like Blogger that might not ping from the same address as the weblog) but I think it’s worth pursuing. One by one, the open, insecure systems of the past (email, weblog comments, trackback…) are being made useless by spammers. It’s going to be a messy place until a more secure alternative emerges. Via ProBlogger I ran across an article at CorporateBlogging: Blogs are Business Support Tools, Not Direct Money Makers. This echoes what Doc Searls said not too long ago, and I’ve heard the same tune from many different places. It’s completely correct, and it’s also completely wrong. Let me explain. Many people have said the same thing about writing computer books: you can’t make money directly with books, but they’re good for your resumé. People who treat this as an absolute are missing the point: there’s more than one approach. There are writers who write for their resumé or reputation, and there are writers who write to make money. Choose topics that are marketable rather than writing about whatever they please. Perform on a publisher’s schedule rather than on their own. Treat writing like a job, work on it full time, and be a team player. Be willing to abandon a book or an entire subject and start over with something else if it isn’t working out. Focus on a topic that sponsors are interested in. Write regularly whether you want to or not, or recruit additional writers. Write and edit professionally to create quality content. Consider your audience’s needs at least as important as your own ideas for the site. Spend time doing unappealing things like marketing the site or contacting sponsors. Be willing to change focus, style, or approach if the status quo isn’t working. A personal weblog (like this one) isn’t likely to make money, and it isn’t intended to. It’s a resumé builder and a personal outlet. A company weblog like Google Blog or a corporate-sponsored weblog like Scoble’s isn’t going to make money directly—they’re business support tools. But a site that follows all of these rules—like PVRBlog or the Weblogs Inc. Network—can certainly make good money. If you’re really interested in making money with a weblog, don’t listen to those who say it’s impossible. I’ve heard the same thing about writing books and running content-oriented websites for years, and I’ve made money doing both. I fully expect to make money with weblogs—in fact I’m already making some through WIN—and many others will too. Just keep in mind that it will take a different focus and different kinds of work than running a personal site or a business support tool, and it certainly won’t be a free lunch. RSS Spam? ZDNet is very confused. What is RSS spam? RSS isn’t anything like email. If you subscribe to a feed, what you get is entirely controlled by the authors of the site. So calling ads in RSS feeds “RSS spam” is like calling ads on Web pages “HTML spam” or ads in magazines “paper spam”. He refers to “the spammer”. Who’s that? The site he’s reading a feed from or some mysterious third party who’s sneaking ads into the RSS feeds? Does he think the fact that he’s “been covering cellular technology a lot” is actually causing him to receive personally-targeted ads in RSS feeds, or is it just bad phrasing? He continues from there by going off on a bizarre tangent about the RSS specification, open source, and “the commons”. Apparently he thinks that the RSS standard includes “ethics” that aren’t being enforced. Or something. Question is, who polices what no one owns? How can we maintain the cleanliness of the commons against those who don’t share its ethics? It’s a question that has haunted the Internet for 10 years now. It’s a question that, frankly, haunts every open source technology. ICANN has a new registrar transfer policy for domain names starting this Friday. It’s designed to make it easier for domain owners to switch registrars. Some of us have been waiting a long time for this, as we have domain names being held hostage by certain Australian domain name registrars who won’t be named here. This was announced back in July with not much reaction from Slashdot and very little discussion anywhere else. Now that the policy is about to be in effect, everyone is spreading panic. Slashdot: new rules make domain hijacking easier. Kottke: ICANN’s Stupidity. Everyone is linking to this article at Netcraft that seems to have started it all. This policy is for registrar transfers, not ownership transfers. It doesn’t make it any easier for a domain to be hijacked, except perhaps by a corrupt registrar. The gaining registrar is still required to confirm the transfer: A transfer must not be allowed to proceed if no confirmation is received by the Gaining Registrar. The big difference here is that the losing registrar has less ways to prevent the transfers. Considering the way some registrars have held domains hostage, this seems like a good thing to me, and I’ll avoid panic until I find a shred of evidence outside that Netcraft article. Ars Technica seems to agree. Update: Jason Kottke has updated his entry to correct this–thanks for quoting me! Another Update: Ross at Random Bytes has posted a rebuttal to Netcraft’s article that goes into lots of detail about the history behind this and the benefits of the new policy. Ross is also Director, Innovation and Research at Tucows, who assisted in initiating the new policy. August 21, 2003: Overture announces that their FAST search engine indexes 3.2 billion documents. August 27, 2003: Google updates its site to indicate that it searches 3.3 billion documents. February 18, 2004: Yahoo announces its new search engine. February 18, 2004: Google expands its index to 6 billion items. November 10, 2004: Google announces an expanded index of over 8 billion items. November 11, 2004: Microsoft debuts its new MSN search engine, indexing 5 billion documents. Anyone who works with large databases knows that “number of items” can be a very vague concept. Google’s number of items could vary depending on whether they decide to include or reject things like duplicates, obvious spam, malformed pages, newly crawled pages, and so on. Considering that they must index millions of new pages every day, it amuses me greatly that the “number of pages” at the bottom of the search page only changes when it’s convenient for marketing purposes. Every week I get seven or eight email messages from challenge-response spam-blocking services like MailBlocks or Earthlink’s Spamblocker, asking me to take a few simple extra steps to get my email delivered. For the most part, I delete them. I don’t believe in services like this because they start with the assumption that the recipient’s time is far more important than mine. Worse, most of the blocked messages are my responses to people’s questions. If you’re going to email me a question, don’t make it hard for me to get the answer to you. I won’t bother. Now I read in techdirt that people like me aren’t the only thing keeping these systems from working. In an ironic twist, the challenge messages are being blocked by spam filters, so the sender often doesn’t see them at all. This makes me wonder: what happens if everyone uses a service like this? Your spam blocker holds the message and sends me a challenge message. My spam blocker holds the challenge message and sends you a challenge. Your spam blocker holds the message…. I imagine MailBlocks has a way to prevent loops like this within their system, but if everyone uses different systems, what can they do? If they start whitelisting anything that looks like a challenge message, spam and viruses will start looking like challenge messages to get through. This whole idea just doesn’t scale. A company called Research and Markets has released a report on the US Market for Subscription-based Websites. You can view a description of the report but the real thing will cost you $280. I normally would have no problem with that—really good research is worth money—but how good could it be based on their description? Days of free web contents are over, when web surfers got a whole lot of something for entirely nothing; from sending free e-greetings to watch live video broadcasts of their favourite football team match without giving a damn to their wallet. These privileges has become history, nevertheless it would be remembered as a pleasant memories. Now I realize that most of these errors are probably simple translation errors, but I have to assume that if they spent so little time and effort on editing the description, they probably didn’t spend enough time researching and fact-checking the report. On top of that, they just published a press release about this report despite the fact that it appears to have been written in January 2003. RankPulse has created something I wished for since the Google API was released: A site that polls Google on 1000 common search phrases, collects data daily, and provides some nice graphs. It’s good to see my quotations site at the top of one of their lists, and I have a feeling there are some great ideas for new sites buried in their database. They didn’t change much, but one thing I notice is that the Directory link has disappeared from the front page. Are users really so search-oriented that Google thinks nobody will miss it? I use Comcast for cable Internet, and I’m generally happy with that. My account there also came with an email address, which I’ve used solely for a few monitoring scripts that run on my server. Nobody knows the address. A few weeks ago, I received a spam message addressed to my Comcast email address. I assumed it was a fluke, but over the last few weeks I’ve received about twenty more. I just changed my username and email address there. There’s a remote, remote chance that someone was guessing random email addresses, but I don’t think mine would have been that easy to guess. So it seems like Comcast might have sold a list of customer addresses. I made the new one longer and more random, so if any spam comes to that one, I’ll know for sure. A post at SXSWblog (and another at a.wholelottanothing) reminded me that wireless networking at most hotels and conference centers isn’t encrypted, and the last thing you want to do is attend a conference with a thousand geeks, all of whom know how to run a packet sniffer, without some sort of protection. The post recommended a service called HotSpotVPN, which is an encrypted VPN you can connect to through the public network. I just signed up – the sign up process is quick and easy if you have a Paypal account handy, and the first week of service is free. It’s $8.88 a month after that. I also thought I’d try their affiliate program, so if you sign up through this link I’ll make a small commission. I know that a blog entry about Mozilla is nearly as much of a cliché as a pop song about love, but I have to say I’m very impressed with the recently renamed Mozilla Firefox browser. Firefox is quickly becoming by default browser for routine administration tasks. Its particular advantage is that it doesn’t forget HTTP passwords randomly like Internet Explorer does, and it remembers usernames and passwords for the various sites I log into more conveniently than IE. Also, I previously mentioned some bookmarklets that make development easier in Mozilla. The Web Developer Extensions take this idea one step further with a toolbar that can disable various features, clear visited links, outline page elements and more. 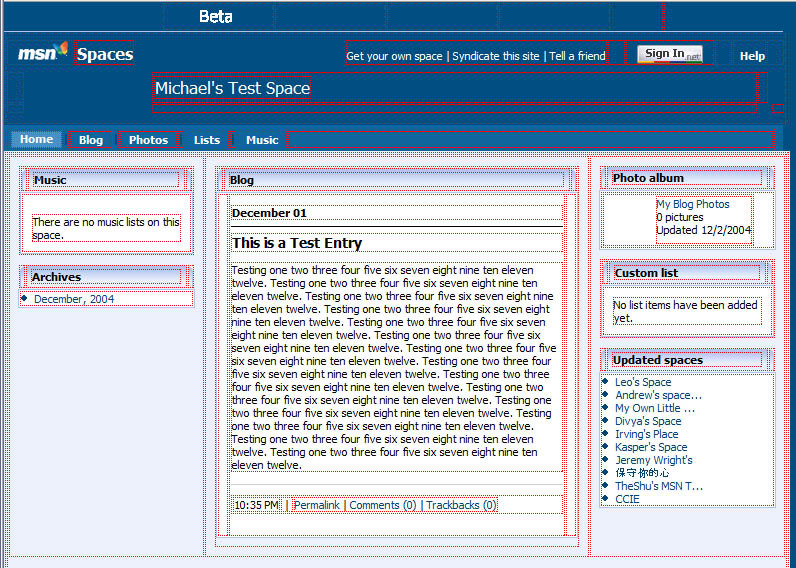 The EditCSS extension adds the ability to make changes to a stylesheet and view the results instantly. This is definitely my new favorite browser for web development. Yahoo has stopped using Google results for their searches sooner than anyone expected. Their search engine is apparently based on Inktomi, but they’ve been very quiet about how it works. I’m not sure if they’re using old data or if their crawler doesn’t understand redirected links like Google’s does, but several outdated URLs for my pages are in Yahoo’s index. The new URLs are also listed. Currently, 36% of referral traffic to my largest site comes from Google and 13% comes from Yahoo. I haven’t seen any changes in these numbers since Yahoo’s switchover. Attention system administrators: Your well-intentioned but misguided attempt to warn me about viruses is driving me insane. You see, the newest viruses forge the sender’s address. And when I say "newest", I mean virtually all of them in the last three years. So when you send a "Virus ALERT" message to the sender’s address, you’re not reaching the infected victim. You’re reaching an innocent party–which often turns out to be me–and creating a nuisance almost as significant as the original virus. I use a number of very old email addresses that are all over the web, meaning I get lots of viruses and that my address is often forged as the sender. I use ClamAV on my server to eliminate the virus messages, and it’s so effective I rarely see a virus message at all. However, I get 10-20 pointless virus warnings per day. Since they’re all different and don’t contain a virus signature, these are almost impossible to filter. So, if you’re an email administrator, or an anti-virus software company, please don’t compound the problem by sending out useless warnings. Thanks. I was recently thinking of starting a blog search engine and aggregator. Then I ran across Ari Paparo’s big list of blog search engines. Maybe there are already enough. I just added this site to ten or so of the search engines, so if you’re a new visitor who came from one of them, welcome! Gary Lawrence Murphy points to a beta RSS gateway that will allow you to read RSS feeds in an old-school NNTP newsreader. If this caught on, he points out that NNTP would solve many of the bandwidth problems of RSS. A particular type of spam/scam called phishing is making the news more and more lately. This is a new cute name for the classic impersonation scheme where you get an email claiming to be from Paypal, eBay, or your bank and asking you to verify your username and password. Via Doc Searls: Gary Lawrence Murphy’s The End of RSS complains about the excessive bandwidth used by his RSS feed. Dan Sugalski also complains. They don’t know the half of it. The Quotations Page offers RSS feeds to syndicate daily quotes. My logs show 74,257 requests for these files on a single day last week. Most downloaded the entire file despite the fact that it changes only once every 24 hours. Based on this, the RSS feeds use 157 MB of bandwidth per day. This is negligible to me (the rest of this busy site uses almost 5 GB per day) but I’ve had to do quite a bit of tweaking over the years to keep the sheer number of RSS requests from overwhelming the server. In my case, a large part of the problem is Ximian Evolution, an information manager for the GNOME linux desktop. My feeds are included by default in every installation, which resulted in an effective distributed DOS attack against my site until I took measures against it. Thousands of sites using this software poll my site every 5 minutes. Nearly 65% of my RSS requests are from Evolution. I have configured Apache to return a 403 error code to these requests. I hate to make the feed useless for these clients, but I had no other choice since my bug reports to the Evolution coders have been consistently ignored, and it will cut my RSS bandwidth in half.